Foreign citizens, PIO(Persons of Indian Origin), OCI (Overseas Citizens of India), NRI(Non Resident Indian) students and NRI sponsored students can apply under the Foreign/ NRI category. These candidates are not required to take the entrance examinations conducted for resident Indian students. 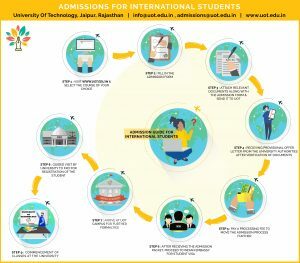 The Office of International Admissions of University of Technology (UOT) is the nodal point for international students. Foreign/ NRI students will generally be admitted at the beginning of academic year commencing in July/August every year. The undergraduate admissions are based on merit and grades obtained in the qualifying examination (equivalent to the 10+2 examinations of India). International students seeking admission to teh PG programmes should have Under Graduate degree equivalent to Indian Graduate Degree. Just send in an email to admission.int@uot.edu.in or make a call to 1800 266 1234 to the Office of Admission for any further details/queries. Foreign Students: Students holding the passport issued by foreign countries including people of Indian origin(who have acquired the nationality of foreign country) are classified as foreign students. Non Resident Indians (NRI): A student who has studied his qualifying examination (equivalent to the 10+2 of India)from a school or college (outside India)will be considered as NRI students. NRI Sponsored Students: An NRI sponsored student is an Indian citizen whose direct blood relative (Parents, Grand Parents, Parent’s direct Brother/Sister or Candidate’s direct Brother/Sister) is an NRI. Fill up the application form and submit it to the Office of Admissions. If the final marks/ results are available, then attach the results. If the marks/ grades are not known or not available at the time of filling the application, please indicate “Results awaited” in the marks/ grades column. Candidates are expected to send their final results to the University as soon as it is available to ascertain their eligibility. It is to be noted that the application will be considered only if the marks/grades are made available to the University within the stipulated time. Step 4: When the application is received, the candidate will be sent a letter of acknowledgement with an application number. Students will also be intimated if additional information is required. Step 5: The admissions packet with all necessary information will be sent to the candidate. After receiving the admission packet student proceed to the Indian Embassy for student VISA. Step 6: Students are advised to reach UOT Campus 1-2 days prior to the commencement of classes and report to the Office of Admissions, University of Technology for submission of their official or original mark sheets/transcripts and other documents as listed in the admission letter. Thereafter candidates will be issued and ‘Admission Order’. Only after the admission formalities are completed students will be permitted to move into the allotted hostels. It is part of the normal mandatory process that all foreign students holding foreign citizenship have to register with the Foreigner’s Registration Office (FRO) within the stipulated time frame of their arrival in India. A student who is a PIO/OCI Card holder is also required to register with the FRO. University of Technology will provide the necessary assistance in this regard.